It’s worth keeping an eye out for the Macdonald Laurier Institute, and taking their ‘independent, non-partisan’ reports with a grain of salt. A new report from the Macdonald Laurier Institute (MLI) dismisses NDP leader Thomas Mulcair’s recent claim that Canada’s oil and gas focused economy is producing economic value that tends to benefit only certain parts of the country. Instead, the MLI report suggests that all provinces will enjoy benefits from oil and gas that far outweigh any ill-effects from this ‘Dutch disease’. Given the timing and the reports’ correlation with the Conservatives’ policy, I began to wonder where the MLI received its funding and who they might be connected with. It turns out this ‘non-partisan’ think-tank is well connected to the Conservative government as well as corporate Canada. Here’s a little of what I have found in an hour of poking around. 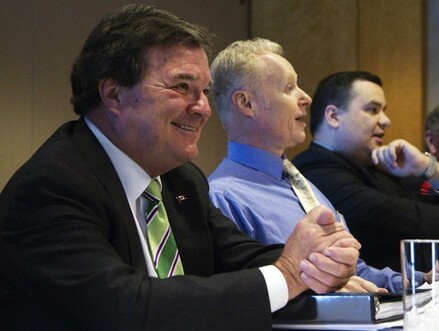 Canadian Finance Minister Jim Flaherty is a major booster of the Macdonald Laurier Institute. As the Globe and Mail reported, in June 2009, Canadian Finance Minister Jim Flaherty hosted a private dinner at the prestigious Albany Club in Toronto with the sole purpose of raising corporate funds for the Macdonald Laurier Institute. In his letter to potential Bay Street funders, Flaherty said “[I am] giving it my personal backing and I hope that you will consider doing the same.” Flaherty had previously appointed MLI Director Brian Lee Crowley as a Visiting Economist in the Finance department. In fact, Crowley was still working with Flaherty in the Finance Department when he began building his ‘non-partisan’ think tank. Remember the Conservatives’ justification for their punitive crime bills in the face of lowering crime rates? They asserted that ‘unreported crime’, if properly counted, would indicate that that the crime rate was, in fact, increasing. This claim of an increasing crime rate in the face of much evidence to the contrary was based on a MLI report by Scott Newark (the report’s findings were refuted here). The Tyee notes that Newark worked briefly as a special advisor to Stockwell Day when Day was Minister of Public Safety. From there, he made use of the revolving door to become project manager overseeing a $300,000-plus contract landed from his former ministry. Crowley, while a small government crusader on many other issues, had no beef with Conservatives’ spending on F-35 Joint Strike Fighter. He suggests that the jets are ‘the price of freedom’ and, presumably, sees no limit to the amount that should be spent on them. Crawley couldn’t bring himself to actually put the figure (likely $26 billion) down in his article, probably knowing that justifying the massive cost overrun might be easier if he kept things a little more general. I’m sure all of this is just the tip of the iceberg, but you get the picture here: the MLI appears to be about as ‘non-partisan’ as Fox News. We would be well advised to take their future reports with a healthy dose of skepticism when they fall directly in line with Conservative policy. p.s. though this post is more about the MLI’s ties to the Conservative Party and Corporate Canada, and less about the report on ‘Dutch Disease’, there are many who challenge the MLI’s claims on the Canada wide benefits of the oil and gas industry. A couple of good examples can be found here and here. Amongst those who lean towards the MLI position, here.